Many a time, the problem some iPad/iPhone users face has always been how to delete synced photos from their device. There is scanty information out there that can prove helpful. If, however, you want to delete your synced photos using iTunes, just follow the steps below. Launch iTunes on your computer and connect your iPad or iPhone with a USB cable. Tap on the device icon from the top left corner on iTunes. Tap on "Photos" from the left-side menu. Click on "Select Albums" and deselect the albums you want to delete. Click Apply and you are done. With a cable, connect your iPhone/iPad to the computer. Tap on the device icon from the top left corner from iTunes. Locate "Photos" tab from the left menu. Mark to un-check the boxes beside any folders you want to delete. Now, click "Apply" which you can see at the bottom-right of the page. There is an excellent way to delete synced photos from iPhone or iPad without iTunes: using iMyFone TunesMate - an effective iPhone manager which enables you to export and delete iPhone photos in buik, including synced photos. Delete unwanted photos from camera roll and photo stream selectively or all at once. Backup photos from iPhone to computer and external hard drive. Extract photo albums (not just photos) from iPhone to computer and external hard drive. TunesMate has received lots of positive reviews from geekreply.com, tricksworldzz.com, etc. Download and install iMyFone on your PC. Then connect your iDevice to your computer via USB cable. On the preview page, select the photos you plan to delete. Click "Delete" button from the top menu. 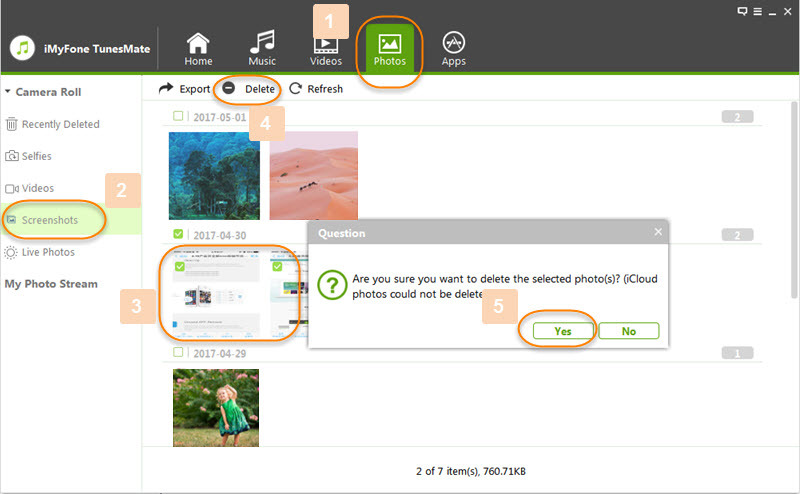 Manage iOS files:With it, you can add/export/delete iPhone music/videos/photos in 1-click. Is CopyTrans Free? What is the Best Alternative?